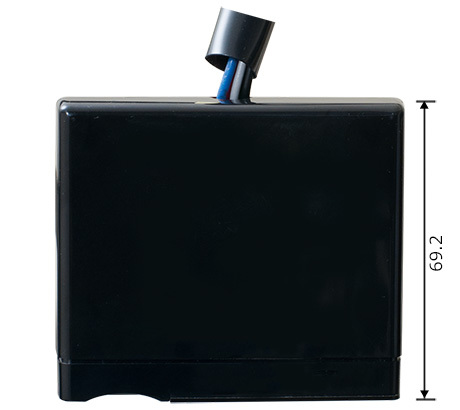 This product is a device applicable to a vehicle starts the engine using the ignition key. 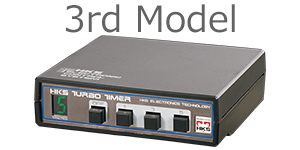 10th generation Turbo Timer evolutionally advanced with the turbo engines. Begin as a must for the turbo engine. The original turbo timer was developed to prevent turbocharger bearing seizure by after-idling. All turbocharger was exposed to the high temperature exhaust gas; therefore, if the engine was shut off without after-idling, the turbine may be damaged. To secure sufficient turbine life, it was necessary to keep the engine idling before the engine was off. HKS Turbo Timer was developed to prevent the turbocharger damage by letting the engine idle even after the engine was off. The turbocharged engine delivered high engine output with small engine displacement. As various turbocharged engine models were released from the automobile manufacturers, HKS redesigned Turbo Timer to provide better operation, visibility, and flexibility in mounting. 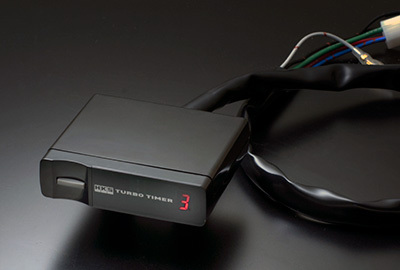 Highly-reputed Turbo Timer was redesigned to a lightweight and compact sized unit for better usability. The push-type switch enabled an operator to use easier. Visibility was improved by a display window. Applicable with 12V and 24V. Liquid crystal display was utilized to Turbo Timer for the first time. The display color was changed to green during stand-by and red-flickering during operation. A countdown takes place every second. Alarm beeps when counting-down is started to notify a user. The main unit case was made by ABS resin molding. Not only the timer function but the design was sophisticated to upgrade the vehicle interior. 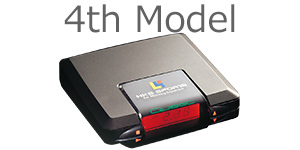 Timer mode and ADD mode enabled a user to select from normal display and active display. 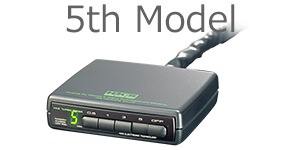 ADD mode accumulated the engine operation time to refer for the engine maintenance not only by the driving distance. The crystal unit for accurate operation and time measurement was built in the main unit. 14 idling time pattern setting, unnecessary idling prevention, and long-term setting were added. New memory function enabled the engine idle depending on the driving conditions, and 3-memory and 4-pattern settings were available. Type-1 for multiple function and Type-0 for basic function. 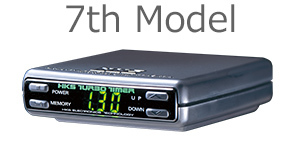 All-around timer for various driving situations and vehicle specifications. Separate type of Timer enhanced flexibility of an installation position. 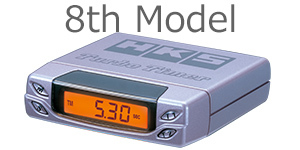 Timer design was decided to give a feeling of unity with other HKS electric products. Also, the industry’s first Turbo Timer for the vehicles equipped with push-start ignition was released. 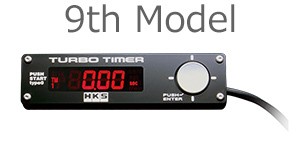 After several redesigning, 9 types of Turbo Timer were released. 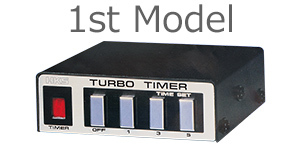 As a result of finding what is truly required as a turbo timer, 10th model is designed to be specialized for timer function. 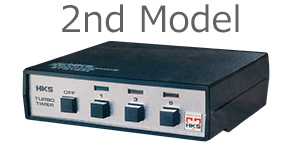 10th ModelSimple and Highly Operable Model from 35-year History. Simple operation just by pressing a switch. Setting Time Range: ：1,　3,　5,　10, and 30 min. Example of One Minute Time Range: Frequent after-idling for daily use. Idling takes place after street driving, commuting, etc. It is convenient when a driver has to leave the car right after the engine is shut off. Example of 3 Minutes Time Range: Effective after-idling after driving a highway. After idling can cool down the turbine and/or engine oil heated up by continuous high speed driving, and the engine shut off without imposing a load to the turbine and/or engine; therefore, the durability of the engine and engine oil is improved. When high load is applied to an engine, and an engine runs at a high speed, the engine and turbine may become in a condition close to a limit. With Turbo Timer, after-idling takes place even if the ignition is turned off by mistake so the engine and turbine may not be damaged. With Turbo Timer, a driver can lock the vehicle door even while running an engine; it allows the vehicle interior temperature maintain when leaving the vehicle for ten minutes or so while reducing a load to a battery. Maximum timer duration is 30 minutes. A long after-idling enables the vehicle interior temperature to be maintained for a long time. Single button control and red LED numerical display simplify operation and improve visibility. 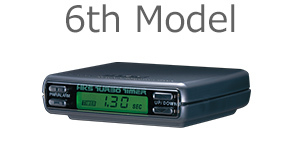 5 time ranges selectable between 1, 3, 5, 10, and 30min. Maximum timer duration is 30 minutes. Accurate time duration can be selected by manual setting. Timer operation stops under unstable conditions caused by low voltage of a battery, etc. ■Application：　Turbo vehicles that start the engine using the ignition key. Not applicable to a vehicle equipped with the push-button ignition. Existing Turbo Timer Harness is compatible. ※This product is not compatible some vehicles. Refer to the application list before purchasing this product. Selecting “OFF mode” turns off the display and buzzer.